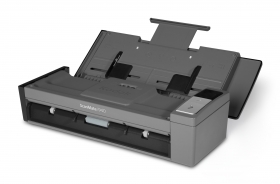 With the Kodak ScanMate i940 Scanner, collecting managing, and distributing information is simple. Kodak's Smart Touch functionality replaces multi-step scanning processes with one-touch simplicity. So you get the compact with the huge impact. Manage, read & organize your business cards, with the powerful software bundle. Create email attachments, picture files and searchable PDFs – automatically upload your documents to the 'cloud', so they can accessed wherever in the world you are. And the USB powered capability lets you bring all this functionality with you, wherever you go, Capture process and send information effortlessly. Free your information and your base of operations with the Kodak ScanMate i940 scanner available now.